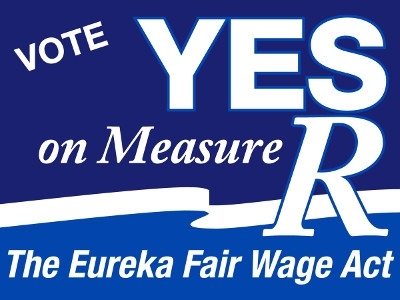 from Editor’s Note: This is the first story in a four-part series looking at Eureka’s Fair Wage Act, known as Measure R, which will be on the city’s Nov. 4 General Election ballot. …. Very Important: We have an immediate need for volunteers to help us CANVASS in Eureka. No experience required! And you don’t have to live in Eureka to help. We have been knocking on doors every day, and we need more people. We will prepare you to canvass for Measure R, provide simple outreach supplies, and pair you up with a person who has experience. Then we’ll hit the streets, talk with Eureka residents about the fight for $12 in Eureka, and register more voters. We’ve registered about 350 Eureka residents so far! We need you to VOLUNTEER your time and energy to help with phone calls, data entry, sign delivery, tabling at events, graphic art, etc.- your skills are needed. YARD SIGNS for Measure R are being made by a small, local printing shop. Very exciting! Let us know if you’d like us to bring you a yard sign (or a smaller window sign) to display at your home or business in support of the Fair Wage Act! Here’s what it looks like. We’re hosting another outdoor FAIR WAGE CAFE at Cesar Chavez Park (Hammond Park), at 14th and F, Eureka (with the tennis courts and playground). It will be held sometime in September, on a Saturday. We’ll finalize the date soon. Enjoy nutritious, yummy food, live local music, kid’s games, and family fun from 12noon to 5pm. Bring friends, co-workers, neighbors, and the whole family out for a day in the park! It’s all free! Measure R recently received the unanimous endorsement of the Humboldt County Democratic Central Committee. Our thanks to them for their support of Measure R, and we’re pleased to add them to the growing list of organizations and individuals that stand behind Eureka’s working families. Brave New Films, a non-profit documentary film company, is making a pro-minimum wage raise video that will be ready by Labor Day weekend. They have contacted us, and we will have the video to show on Access Humboldt, the internet, wherever we (and you) can spread it. It will include Eureka’s Measure R information! Please consider giving a FINANCIAL DONATION of any amount to the Measure R campaign. It is run solely by volunteers in the community. Donations will help us print important campaign materials, fund radio spots, and help pay for web space. Donate today at FAIRWAGES.ORG. You can mail us a contribution, donate online, hand us money, a check, or money order in person– however it works for you! If you haven’t seen our new website, please go to its easy-to-remember address, fairwages.org. Also, we continue to host the blog, eurekafairwageact.wordpress.com where, for almost two years, we’ve been posting research, news, events, etc. about raising wages. We’re on Facebook. “Friend” us at Fair Wage Folks. 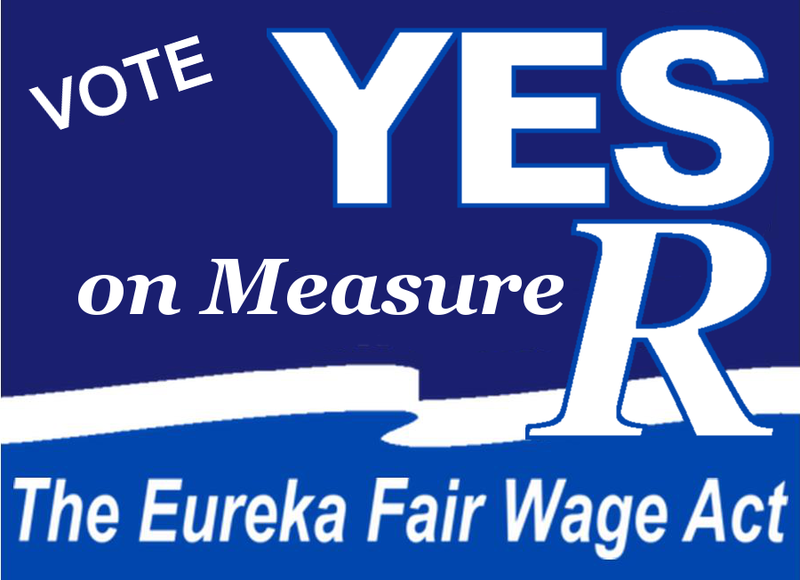 “Like” us at Eureka Fair Wage Act and Measure R.
Help us get the vote out for Measure R! Fair is fair! We need this! -Dr. Martin Luther King, Jr. Speech to Memphis Sanitation Workers a few days before his assassination. In his statement, Jelinek said Costco’s starting pay is $11.50 an hour in the United States. After many requests on my part the Congress passed a Fair Labor Standards Act, what we call the Wages and Hours Bill. That Act –applying to products in interstate commerce — ends child labor, sets a floor below wages and a ceiling over hours of labor. Do not let any calamity-howling executive with an income of $1,000.00 a day, who has been turning his employees over to the Government relief rolls in order to preserve his company’s undistributed reserves, tell you — using his stockholders’ money to pay the postage for his personal opinions — tell you that a wage of $11.00 a week is going to have a disastrous effect on all American industry. Fortunately for business as a whole, and therefore for the Nation, that type of executive is a rarity with whom most business executives most heartily disagree. “Yesterday’s Eureka Reporter article: “Two Candidates Suggest Raising Minimum Wage,” discussed George Clark and Linda Atkins proposal to raise Eureka’s minimum wage from $8 to $9 per hour. Concerned about the fact that Eureka’s workers’ median income level is only 51% of the statewide average, Clark and Atkins feel that raising the minimum wage is a necessary first step, as part of a comprehensive effort to get Eureka’s economy back on track. The article also featured the reaction of Linda and George’s opponents in their race for Eureka City Council: Polly Endert and Frank Jäger respectively. “It’s totally the wrong approach,” according to Polly Endert and Frank Jäger added, “It’s a great idea, but it’s a job killer.” The evidence shows minimum wage initiatives are neither “totally wrong” nor “job killers.” They are, however, often resisted by entrenched moneyed interests whose influence in this campaign once again threatens the future of Eureka’s working families. When it comes to raising the minimum wage, Linda Atkins and George Clark feel the facts should speak for themselves. A particularly interesting study was done from 2001 to 2005 comparing employment growth between 11 states that operated with minimum wage levels higher than the Federal standard and 33 others that did not. The states operating with the higher minimum wage experienced overall job growth of 0.57 %, while those that maintained the lower Federal minimum wage had a 0.52% growth rate. In other words employment growth was actually slightly faster in those states which paid minimum wages greater than the Federal level. Given the enormous amount of evidence that contradicts Frank and Polly’s “sky is falling” reaction to the idea of raising the minimum wage for Eureka’s working families, are we to conclude that they simply don’t get it or is this what having “no agenda” means to them?